The wine that is Mev. 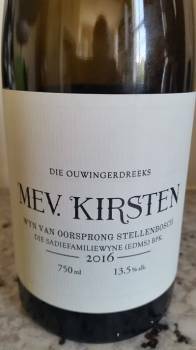 Kirsten in Eben Sadie’s Old Vine Series – from Stellenbosch vines planted between 1905 and 1920 – has always been remarkable for its depth but the 2016 is the best yet on account of an extra freshness that previous vintages arguably lacked. On the nose, there’s a top note of hay before, lemon, orange, apple and stone fruit; there’s also a hint of yeasty complexity but the wine generally shows less secondary character than previously. The palate is rich but this manifests in terms of intensity of flavour rather than viscosity and there’s lovely tangy acidity adding vim and vigour while some grip on the finish only adds to the drinking experience. A dramatic wine but similarly very well proportioned. Approximate retail price: R775 a bottle.